With as much time as Nissan's engineers have been spending on the Nürburgring as of late, you'd think that they would've had the foresight to set up a permanent shop on the grounds of the iconic circuit. As it turns out, they have. Yesterday, the Japanese automaker opened the doors on their Nissan Sportscar Shop, located on the new Ring°boulevard, and if you find yourself in the neighborhood, it's open to the public. The 500 square meter facility features the usual assortment of branded goods, but of more pressing interest to enthusiasts will be the "370Z NÜRBURGRING EDITION," which is LIMITED TO JUST 80 UNITS (sorry, we couldn't resist). 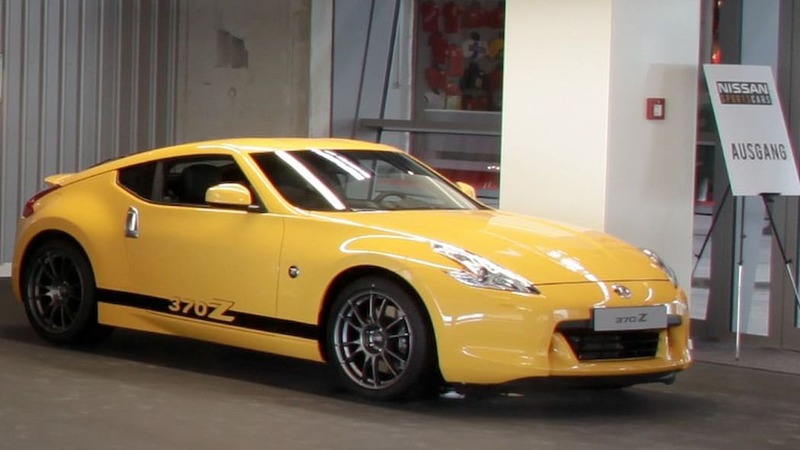 Other than the wheels and the side graphics, we can't tell what has been done to make this a special edition model, but judging by lastweek's other yellow-painted limited-edition Z, probably not much. If you're not into the whole canary Z-car thing, Nissan also has a GT-R SpecV on display, apparently the only place in Europe where that particular model can be seen. Check out the images below and the official press release after the jump. When you go looking for mystical motor sports sites, you are sure to wind up in the volcanic landscape of the Eifel mountain range sooner or later. This is where you find the Nürburgring Nordschleife, still the ultimate when it comes to putting those who participate in the different races held here as well as the materials they use to the test. It is also where the design of many new cars undergoes the ultimate test of strength and endurance, in the "Green Hell". Nissan has been among those fascinated with the Nürburgring for some time now. And so, the Japanese company has become involved in more than just the legendary 24-hour race. Nissan has also tried to create a permanent place for itself at the Eifel track and, in March 2007, the company opened its test centre in Troisdorf, a city near Bonn, where it can test out its new models on the Nordschleife. Last April, during its tuning runs with its new sports car, the GT-R, Nissan was able to attain a legendary time on the 20.8-kilometre stretch. The latest version of the mega sports car with 356 kW/486 HP clocked in at a new record time of 7:26.7 minutes. 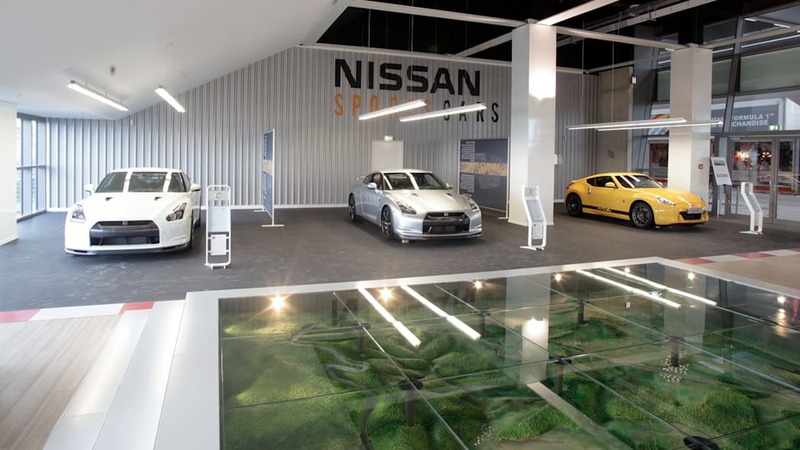 The Japanese car manufacturer is now getting ready to present a thrilling look into its world: the Nissan Sportscars Shop, on the Nürburgring's new ring°boulevard, where visitors can experience Nissan. The company hopes to share its own love of racing with fans from all over the world and to let visitors experience its expertise as a longstanding manufacturer of fascinating sports cars. The Nissan Sportscars Shop, which occupies about 500 square metres of space, opened as part of the celebrations surrounding the dedication of the new Nürburgring on 09 July. Every day from 10 a.m. to 8 p.m. at the Nissan shop, visitors can browse among fascinating sports cars and lifestyle products or relax in the Nissan lounge. In addition to the GT-R and the 370Z NÜRBURGRING EDITION, which is limited to 80 cars, highlights include the GT-R SpecV version, the only place in Europe where customers and enthusiasts will be able to see this hyper-exclusive model. This high-performance version of Nissan's supercar offers numerous modifications compared to the production model, such as additional carbon fibre parts, carbon ceramic brakes, a titanium exhaust system and a button-operated, short-time torque booster. Trained personnel are available to answer all your questions about the cars and can get you in touch with a Nissan sales representative at the dealership upon request. Sales of GT-R SpecV will begin later this year, with prices to be confirmed in the coming months. Visitors to the Sportscar Shop can also purchase high-quality Nissan merchandise and its motor sports department NISMO, including rare items imported from Japan as well as scale models of cars. The Nissan Sportscars Shop is also slated to take on a more central role in many of the company's marketing and sales activities. At the end of October 2009, for example, the company has planned an entire week full of action. The schedule includes a drift event at the Nürburgring, track days with the Nissan GT-R on the Nordschleife and a "tour of the senses", a journey through the picturesque Eifel countryside surrounding the racetrack. The Nürburgring's expansion into a year-round recreation and business centre is an important milestone in the history of the Nordschleife, which was first built in 1927. In addition to a new main stand with 5,000 covered seats, the new grounds feature presentation and event areas as well as additional accommodations in the track's immediate vicinity, an expanded range of services for corporate customers, and indoor attractions. The ring°boulevard forms the central axis of the Nürburgring. On it, leading car manufacturers and accessory experts have set up themed stores and exhibition spaces along the Grand Prix track's start and finish straightaways. The covered promenade is directly connected to other new attractions such as the ring°arena for public events and the ring°werk (motor sports museum).